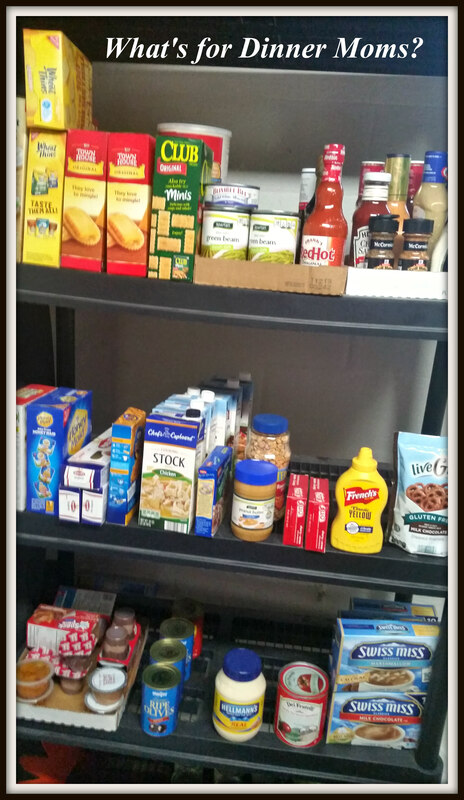 KonMari Your Pantry – What's for Dinner Moms? I am in love with Marie Kondo. If you may have seen her Netflix show, read her books, or even heard your friends talking about her on Facebook. I was aware of her about a year ago but really didn’t understand the concepts until I saw the Netflix series. Some people are saying she says keep only 30 books or so (which my cookbook collection exceeds several times over). But, if you explore a bit more this is what she has because that is what is good for her. You will not need to get rid of everything you own and have only cookies and wine in your pantry because that is what you love. First, go through the piles of food and sort them into categories that make sense to you. Types of food, how you use them, or when you use them, it is up to you. As you are doing this find the best by or expiration dates. Yes, they really are two different things. Best by mean that the food is still okay to eat after that date but the texture or flavor may begin to change. The expiration date is don’t eat this after this date. Some people are willing to eat food after the expiration date. I am not. It is up to you. Recycle boxes and jars if you can and throw away the food if you need to. Now if this were clothing or books, Marie Kondo would ask you, “Do you love this item or does it bring you joy?” With food it is partially do I love this because if you don’t, you won’t use it unless you REALLY have to. But, it is more of a will I realistically use this item in the next x days, weeks, or months. If you feel guilty because you bought the special spice or food item to make a specific dish and then never did that item sitting on your shelves can make you feel bad every time you go to your shelves thinking about how you never made this dish or how you spent your money. You don’t want to feel bad or guilty about feeding yourself and your family. Make a decision. Decide I will use this now and make the dish or if the item is still good I will donate it or give it to someone who can use it. Let it go if it is not going to be enjoyed by you and just rot on your shelves. As you place the items on the shelves think of different ways you can feed your family with these items and how grateful you are for the food you have. It has changed my perspective a bit. I do this 2-3 times a year now so that I am no longer throwing away as much food as I used to. Items don’t sit expired or unused on my shelves forever just getting moved around. Enjoy your pantries and feel the gratitude you have for your house and food. Good blog. This is the first time I have heard of her. I have had to do this because of my fixed income and dependency on local food pantries. It is a real challenge trying to figure out a good way to use items that would not normally be your choice. After several months you find yourself with 6 extra cans of something. Also you are given expired foods and sadly sometimes it isn’t usable. I mark all my items with the expiration date with a sharpy so I can easily see it. That reminds me I need to find a recipe to use it. I went over the 30 cookbook threshold 25 years ago. I am always looking through them for ideas. It is also feast or famine at the food banks so I store items like the 6 extra cans for times like that. So you have to rotate through your pantry putting the oldest items in front. Your pantry looks nice. Thanks for sharing this. Thank you! That is a great tip about the Sharpie so much easier to see than the stamped dates on the boxes and cans. What are some of the items that you struggle to find ways to cook with? I am thinking of maybe trying to find things to do with odd items – Spam, olives, or anchovies. Great tips!! 💕 I will have to look into her. Sounds a bit like minimalist approach. Much more minimalist. But, she also says make the decisions for yourself. I cannot tell you what to keep or how many but it is up to you to decide. I like that part. Lol! It took me about 2-3 days. I have 4 sets of shelves in my basement. The upstairs pantry is a whole day too.